It sounds like a whole lot of Venom wound up on the cutting room floor as Tom Hardy says there is about 40 minutes worth of deleted scenes. The upcoming Spider-Man spin-off, which won't feature Spider-Man and isn't connected to the Marvel Cinematic Universe in any way, is set to arrive in theaters this weekend and, perhaps not hype, but curiosity is at its highest point. Based on Hardy's latest comments, that curiosity is only going to increase. The cast and filmmakers behind Venom have been making the press rounds promoting the blockbuster comic book adaptation. 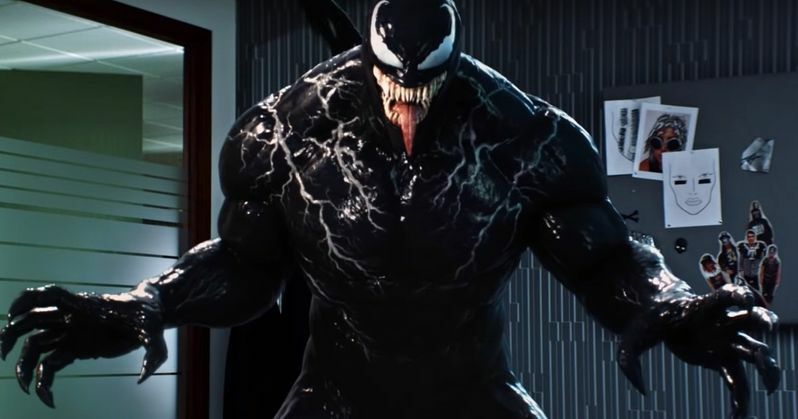 During a recent interview, Tom Hardy was asked about what his favorite scene in the movie was and the actor, who plays Eddie Brock, the man who is taken over by a symbiote and is turned into the titular character, revealed that there is a whole lot of unused material, which includes some pretty bizarre stuff. Here's what Hardy had to say when asked what his favorite scene is. "Things that aren't in this movie. There are like 30 to 40 minutes worth of scenes that aren't in this movie... all of them. Mad puppeteering scenes, dark comedy scenes. You know what I mean? They just never made it in." There is actually quite a bit to dissect with this statement. First off, the sheer amount of material sounds like a lot. However, movies tend to have much longer first cuts and a lot of stuff that is shot isn't used in the final cut. For example, Blade Runner 2049 had a four-hour cut before it was whittled down to what was released in theaters. So the amount of material doesn't seem terribly surprising when looking at it strictly from that point of view. Where this obviously gets a little nuts is when it comes to what Tom Hardy says is in those lost minutes of footage. What kind of mad puppeteering could have possibly been shot for Venom in the first place? Dark comedy is interesting enough, but it sounds like there is some truly bizarre stuff that was filmed and may never see the light of day. It raises questions. Why was this stuff shot in the first place? Why was it axed from the final cut? Probably because Sony wants this movie to be very commercially successful, which is why they went for a PG-13 rating, as opposed an R-rating, which many were hoping for. To that last point, it doesn't appear as though this material was scrapped because they were trying to soften the movie up any. Director Ruben Fleischer claims that they were always gunning for a PG-13 rating, even if Tom Hardy is hoping for an R-rated sequel down the line. So who knows? Hopefully, we'll get to see some of this whacky sounding deleted material on the Blu-ray release. Venom is set to hit theaters on October 5. You can check out the full interview clip with Tom Hardy from the Comics Explained YouTube channel for yourself below.